Why is pitching a no-hitter so difficult for pitchers? You might question your ability to continue being perfect on the mound. Do you start looking ahead to the outcome? What it’ll mean to throw a no-hitter and how good that will feel? Cardinals’ pitcher, Michael Wacha took a no-hitter into the 9th inning against the Pirates on Sunday at Busch Stadium. In 2001, Cardinals’ Bud Smith had a no-hitter on the road. Since then, a no-hitter has been taken into the 9th inning just twice; Wacha both times. Only two no-hitters, both by Forsch, have been thrown in St. Louis since 1924. A no-hitter, to say the least, has been rare in Cardinal history. On Sunday, against the Pirates, Wacha was almost the first to throw a no-hitter in over 90 years. In the top of the 9th, Pittsburgh pinch-hitter, Colin Moran lined a shot over Wong’s glove to end the thus far, flawless game by Wacha. Similar to Matheny’s statement, pitchers, or baseball players in general get distracted by their spectacular performance or the outcome or start to doubt their ability to continue playing at that level. A pitcher might be throwing a no-hitter going into the 7th inning and they get excited about the way they’re performing; anxious to get it done. They may also realize what they have going and start to focus on the outcome; pitching a no-hitter. These become distractions and they struggle to continue focusing on one pitch at a time. They shift focus away from what got them in the no-hitter position in the first place; the laser-like, process-oriented focus. On the other hand, a batter might be on their way to hitting for the cycle. In their fourth at-bat, they realize what’s going on or maybe a teammate commented on their performance so far. They begin to think about their hit and what it needs to be, rather than continuing to play freely. When a baseball player is having an exceptional performance, and notices it, they can easily become distracted by factors that pull them away from the game that got them to that point. To help bring that concentration back to a “one-pitch-at-a-time” mindset, focus on your very next task at hand. If you’re pitching, what do you need to think about for the next pitch? If you’re batting, what do you need to focus on for your on-deck preparation and in the box? Use a keyword that directs your attention, such as, “Target,” “Just throw,”” “See the ball,” “Trust,” etc. Instead of trying to block out distractions, direct your focus to what you WANT to do during your pre-pitch routine. 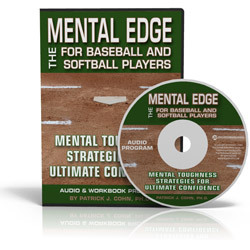 Get The Mental Edge For Baseball and Softball Players! Do you (or your athletes) lack full confidence in your skills when you step on the field as if your game disappears at game time? Do you lose composure easily after you make your first error of time game? Do you feel embarrassed after striking out and carry this with you for longer than one inning? If you answered yes to any of these questions, check out The Mental Edge For Baseball And Softball Players! Boost your (or your athletes mental) toughness! Learn 8 mental toughness lessons to help ball players improve confidence, focus and composure. Download your copy TODAY and start boosting your mental toughness! What are baseball mental game customers saying? If you have trouble taking your practice game to competition and under perform in games, your mental game might be the culprit! With The Mental Edge For Baseball and Softball Players, you will discover how to take full control of your self-confidence instead of reacting to every pitch. 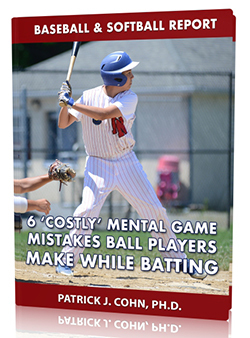 With this new audio and workbook program, you'll learn you how to improve your mental game in 8 easy-to-apply-lessons- the same TOP lessons that Dr. Cohn teaches to baseball and softball players everyday in his one-on-one mental coaching program. Seven bonus programs included! Top Baseball Psychology Resources To Improve Performance! Instilling Confidence in Baseball and Softball Players - A 7-day plan for coaches. 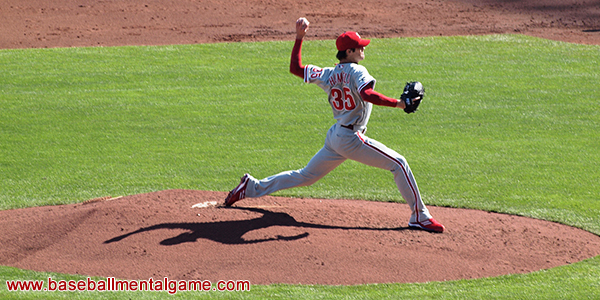 Baseball Psychology Articles - Read other mental game articles to improve your performance.